Milano-Premium Personal Blogger Template is clean coded with three color colors used in white, green and blue colors. This is a feature for gallery templates. I created a social bookmark build with the prepared the search box widget. Some of the best Milano features include Page Navigation Menu Gallery Styles, Auto Thumbnails, Business, Magazine Blogs.Milano Free Customizable Blogger Template is the best option for your simple blog. 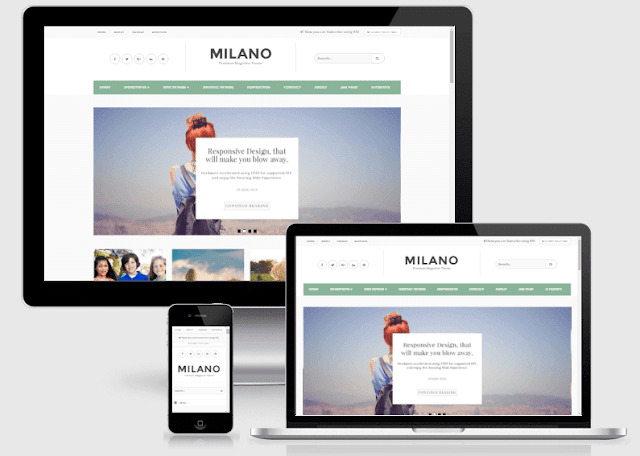 Milano Premium Responsive blogging theme which is suit for every website. This blog offers a wide variety of blogs, personal blogs, travel, food and food items, fashion, entertainment, etc. It's a Responsive and Great design mix based on the latest trends. It's's super-responsive, which fits your content well on all devices. Matching easily installs and optimizes easily and rarely coding knowledge. Everything is possible with drag and drop with our efficient and user-friendly structure. However, if you have coding knowledge, then is the perfect framework for developers. 100% Pure Responsive: Milano free blogger template also provides a highly responsive experience for your users. It fits perfectly on every device and we have tested it on top browsers such as Chrome, Firefox, Safari and Microsoft Browser.